Wallis (M) Grey soft Knit Dress, with beads/sequin detail on the shoulders. Wallis (M) knitted dress with Sequin detail ideal for a special occasion. measurements approx: 46 cm bust, waist and hips • Zip closure • Sequin detail on shoulders • Knit style dress • Hand wash only Would make a lovely addition to any wardrobe! Really pretty dress in immaculate condition with no signs of wear whatsoever. WAIST 15" WHEN LAID FLAT STRAIGHT ACROSS. MACHINE WASHABLE. THE LINING IS BLACK AND WHITE. BUST PIT TO PIT 17". TOP LAYER HAS SLITS AROUND HEMLINE WHICH SHOWS THE LONGER. Very useful and pretty Wallsi dress with sleeves and sweetheart neckline. Dress length from shoulder 40". Sleeve length 17". Wallis black drape neck maxi dress. 100% viscose main body. Size 12. 47" total length approx. Gorgeous good quality satin look dress. Perfect for a wedding / special occasion/ prom etc. Zip up back. Fully lined with net underskirt. Approx 52” long from top to bottom hem. Looks lovely on. Gorgeous Wallis Ladies Black, Pink, and cream coloured Dress And light Jacket / Balerno. Beautiful floral design and lightweight dress and jacket. The dress is 50" on length from Shoulder to hemline. Wallis Wrap Dress VGC STRETCH FABRIC. SIZE UK 12 STRETCH - VGC Grey pink & white leaf design on a black background. GREY & Pink Fit & Flare Dress Size 12. A comfy to wear but very smart dress - 3/4 sleeves fixed wrap over - side rouching around midriff - deep v-neck which looks nice with a white silky camisole vest if you want to cover more chest. W al li s dr es s si ze 1 6 wo rn o nc e.
WALLIS BROWN & BEIGE WRAP DRESS. SIZE 12 PETITE. JUST BELOW KNEE WRAP AROUND SKIRT. TIES TO SIDES TO WRAP AROUND TO WAIST. MACHINE WASHABLE. 3/4 LENGTH SLEEVES. Black/White Dress with Stretch and Belt. Machine Washable. Length 44". Wallis Patita Black Dress With Unique Sequen Designe In Size 12/UK. Please study all the photos carefully and ask all your questions before purchasing as no return offered. 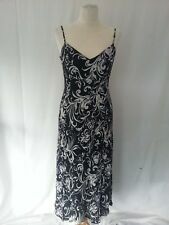 Wallis Dress Size 16. Dispatched with Royal Mail 1st Class.